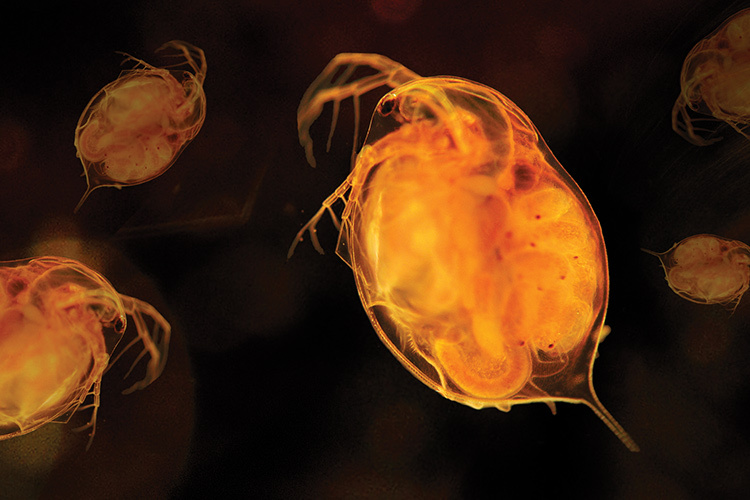 UWM’s role in a Nobel Prize-winning effort helped pull back the curtain on the unseen universe. Jolien Creighton was visiting family in Calgary, Canada, when the brief text came in from an Irish phone number: “BNS + GRB. Real and For Sure.” A cryptic message for most, but the UWM professor of physics instantly knew its significance. It was Aug. 17, 2017, and he’d just been told that a decades-old quest had at last succeeded. The message came from UWM colleague and physics professor Patrick Brady, who, while traveling in his home country of Ireland, had just distilled a cosmic event of unimaginable magnitude down to six words. Two far-off celestial objects called neutron stars had been orbiting one another, and they’d merged in cataclysmic collision, the likes of which had never been directly observed. A neutron star is the relatively small but ultra-dense core that remains after a once-massive star goes supernova. The merger of this binary neutron star system – shortened to BNS in the text message – created ripples in spacetime called gravitational waves. Scientists knew of the collision because those waves were detected 130 million light-years away on Earth by the Laser Interferometer Gravitational-Wave Observatory, or LIGO, for short. Simultaneously, from the same spot in the sky, a different type of observatory detected a corresponding gamma ray burst – the text message’s GRB. 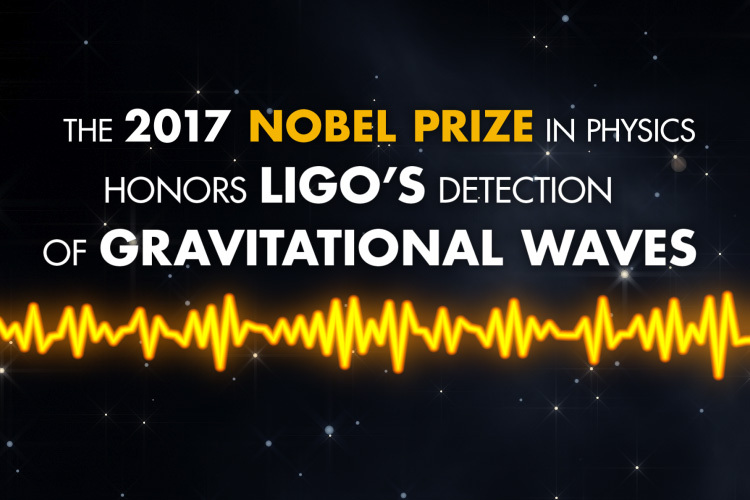 LIGO was two years removed from making humanity’s first detection of gravitational waves, a breakthrough that earned LIGO’s project leaders the 2017 Nobel Prize in physics. A team of UWM physicists, led by Brady, plays a key role in the LIGO project. They designed, built and maintain computational tools that handle LIGO’s massive amounts of data, so they shared in the Nobel celebration, even if they weren’t named on the award. Gravitational wave astronomy had given scientists a new way to view the universe and collect data previously inaccessible through conventional telescopes. That initial LIGO detection in late 2015 stemmed from the collision between two black holes. Because black holes have such strong gravitational fields that no light or radiation can escape, they’re impossible to directly observe with traditional telescopes. But the neutron star collision was different. If traditional observatories knew where and when to look, they could also collect data on a slew of unanswered questions. That’s why UWM radio astronomer David Kaplan, while at a conference in Washington, D.C., on Aug. 17, began receiving a flurry of notices about the neutron star event. He is part of a consortium of astronomers who had arranged to follow up on LIGO discoveries with more traditional telescopes. So Kaplan quickly arranged for his colleagues to point radio telescopes at the collision. Within hours, astronomers around the world were responding to LIGO’s alarm. After careful analysis and verification, the discovery was revealed to the world on Oct. 16, 2017. The binary neutron star event might be described as the end of the beginning of a new era in astronomy. It firmly established the role gravitational waves can play in multi-messenger astronomy – the observation of celestial events across multiple mediums, including visible light, radio waves, X-rays, cosmic rays and neutrinos. Each approach offers different insights into different types of phenomena, and humanity’s ability to investigate the universe grows exponentially more comprehensive. 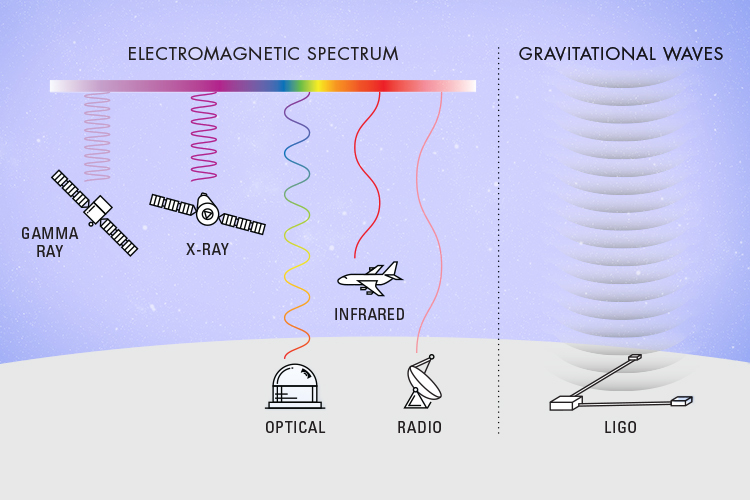 Since Galileo's telescope, we have studied the universe by collecting electromagnetic radiation that has traveled through spacetime from distant objects. With LIGO, we have entered an era in which we study the universe via waves in spacetime itself that are created by the acceleration of matter. Although LIGO’s discovery of the colliding black holes in 2015 seized the public imagination, the neutron star collision dovetails with the deeper history of gravitational wave science. In 1916, Albert Einstein predicted gravitational waves as a consequence of his general theory of relativity: Any moving mass would create ripples in spacetime, the fabric of the universe itself. Einstein also suspected detection of the waves would be technologically out of reach because they would be vanishingly small. A breakthrough came in 1974, when astronomers Russell Alan Hulse and Joseph Hooton Taylor Jr. discovered two neutron stars orbiting one another – a binary neutron star. Upon closer analysis, they saw the orbit was gradually shrinking. They realized Einstein’s theory accounted for the orbital change: The system was losing orbital energy as it generated waves of gravitational energy. This first indirect observation of gravitational waves earned Hulse and Taylor the 1993 Nobel Prize in physics. 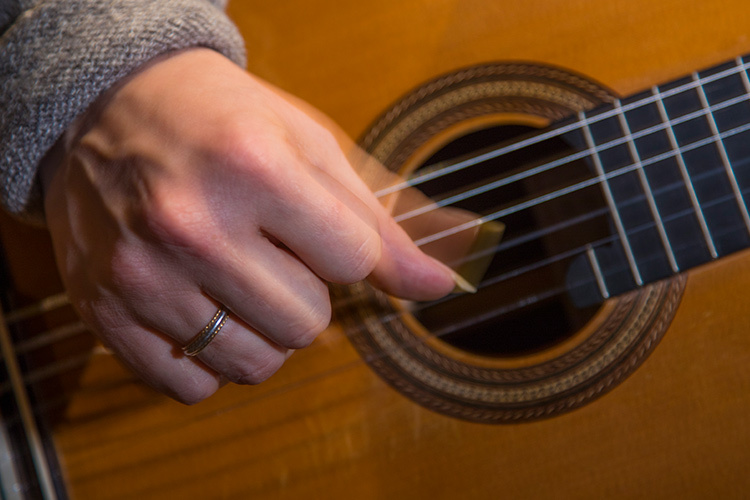 Around that time, Massachusetts Institute of Technology physicist Rainer Weiss published a study about using interferometry – comparing overlapping light waves – as a highly sensitive way to detect gravitational waves. He was building on the insight that the stretching and shrinking of spacetime by gravitational waves could cause a pair of otherwise identical light beams to shift, creating interference that could be detected and analyzed. Meanwhile, Kip Thorne, a theoretical physicist at the California Institute of Technology, was investigating possible sources of gravitational waves and what their signals might look like. He was convinced that such waves from cosmic collisions could indeed be detected. Together, Weiss and Thorne convinced the National Science Foundation that gravitational wave observation was feasible. They proposed two identical observatories separated by thousands of miles, each featuring a pair of 4-kilometer-long arms set at right angles. 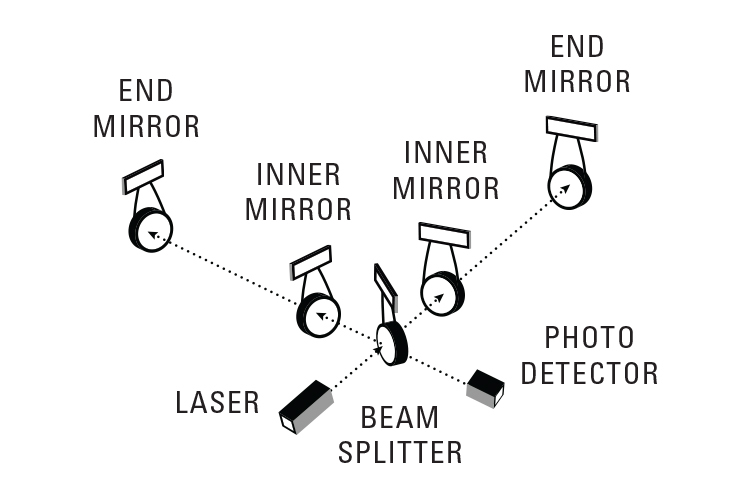 A laser, split into two identical beams, would travel down each arm, reflecting back and forth between mirrors at each end. In a fraction of a second, the beams would travel about 1,100 kilometers, then be recombined and directed to a detector for comparison. If passing gravitational waves distorted spacetime and the beams during their brief trips down the arms, the resulting discrepancy would be recorded. The LIGO Scientific Collaboration was established in 1997, and UWM was among its founding members. At Caltech, Thorne had assembled a group of graduate students and postdoctoral researchers to tackle many of LIGO’s challenges, from computer infrastructure to theory and analysis, and all the details in between. Among them was Brady, who has devoted his scholarly career to studying black holes and became directly involved in LIGO in the mid-1990s during a postdoctoral fellowship at Caltech. Creighton and Alan Wiseman were also doing research with Thorne at the same time. Wiseman, now a UWM associate professor of physics, came to UWM in 1998. He joined Bruce Allen, who had been at UWM since 1989, in developing the computing infrastructure required to analyze LIGO’s data. Brady and Creighton arrived at UWM in 1999 to work on the theoretical aspects of the gravitational wave signals. In 2002, Xavier Siemens joined UWM’s LIGO team and worked to develop the data calibration – converting the electrical signals from LIGO’s detectors into data that allowed gravitational waves to be seen. Allen left his full-time role at UWM in 2007 and is now director of the Max Planck Institute for Gravitational Physics in Germany. LIGO first went online in 2002, then was shut down in 2010 for upgrades, which were completed by September 2015. Now called Advanced LIGO, its facilities were still being ramped up to full operation when they recorded what appeared to be a textbook gravitational wave. The signal was so unambiguous that some initially suspected it was really just test data injected into the data stream. But on Feb. 11, 2016, after months of painstaking verification, the LIGO team confirmed Einstein’s 100-year-old prediction. LIGO had detected gravitational waves generated 1.3 billion light-years away by the collision of two massive black holes – 36 and 29 times the mass of the sun. The magnitude of the collision was the primary reason the detection was so clear. In October 2017, Rainer Weiss, Kip Thorne and Barry Barish (who had overseen management of the enormous project) were awarded the Nobel Prize in physics for their LIGO vision and leadership. More black hole-generated gravitational wave discoveries followed the 2016 confirmation, and slowly, Brady’s thoughts turned from black holes to neutron stars. So when LIGO again sounded the alarm on Aug. 17, 2017, it marked another scientific milestone. Notified by their gravitational wave colleagues, astronomers found the explosion in galaxy NGC 4993 within hours. Traditional optical observatories, radio telescopes and orbiting instruments trained their tools to a spot in the sky 130 million light-years away. In all, hundreds of astronomers, using telescopes on all seven continents and in space, followed this event nonstop until the source disappeared behind the sun. Medieval alchemists never found the legendary substance that would enable them to turn base elements into gold. But astronomers, in their observations of the neutron star collision, finally witnessed the processes suspected as the source of heavy elements like gold, platinum and uranium, whose abundance in the universe had been something of a mystery. And neutron stars hold valued secrets beyond gold. They are a unique source containing a hyper-dense type of matter, a teaspoon of which would weigh 10 million tons. 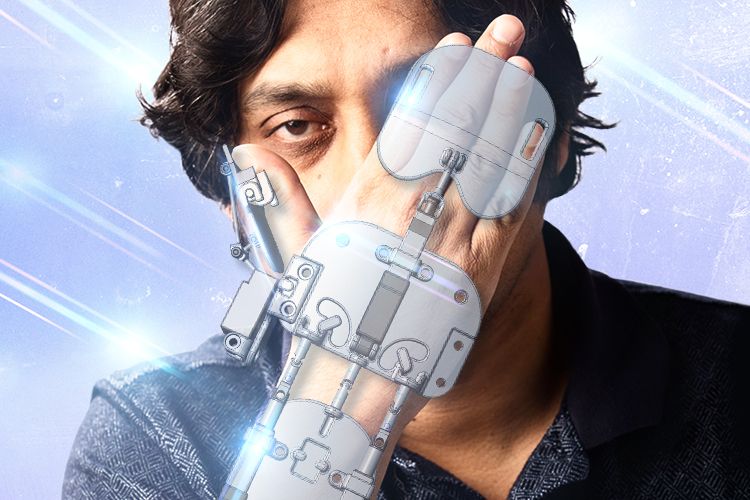 “It’s not something you can create in a laboratory. You can never do this experiment on Earth,” says Creighton, co-chair of LIGO’s Compact Binary Coalescence group. “The only place in the universe where this sort of matter exists is in neutron stars. It’s a challenge he welcomes. Each answered question will surely prompt more. And, as LIGO and its astronomical partners go forward, its objectives may well change. “If you look at the questions that motivated the creation of the Hubble Space Telescope, they are entirely different from what Hubble is doing now,” Kaplan says. “In the same way, if you look at the LIGO proposals, you see questions it is already answering.